Weslaco police issued these video captures of the suspect in the robbery of a store Monday night. 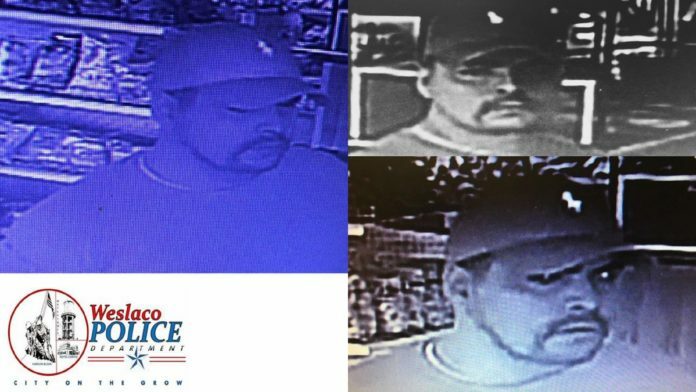 WESLACO — Police are asking the public for help in identifying a male involved in an aggravated robbery that took place Monday evening. The incident occurred at 7 p.m. in the First Aid Station convenience store, at 2721 W. Business Highway 83. The suspect entered the store wearing a red polo cap, red shirt, long-sleeve undershirt and blue jean pants. He grabbed the female clerk and placed a knife to her throat, police said. The clerk opened the register and the man left with the money in an “older model” red four-door vehicle, possibly a Sable or Taurus. Anyone with information on this crime may contact the Weslaco Police Department’s Criminal Investigations Division (CID) at (956) 968-8591. Those wanting to remain anonymous and possibly qualify for a cash reward may contact Weslaco Crime Stoppers at (956) 968-TIPS (8477) or leave an anonymous tip at www.weslacocrimestoppers.com.